Prince Avalanche is a touching indie comedy drama directed by David Gordon Green, who previously directed stoner comedies Pineapple Express (2008), Your Highness (2011) and The Sitter (2011). Green returns to his roots as an independent director, taking a chance with a project very much outside of the studio system and with much more subtlety than his last few directorial offerings. The film is based on the little known Icelandic film, Either Way (2011), which won three awards from 11 nominations at the Edda Awards (Icelandic Oscars), and Green’s US remake has also received critical acclaim, winning the Silver Bear for Best Director at the 63rd Berlin International Film Festival as well as being nominated for the prestigious Golden Berlin Bear. Set in 1988, overgrown boy-scout Alvin (Paul Rudd) and his slow co-worker Lance (Emile Hirsch) are two road workers repainting the line down the middle of a Texan forest road that is recovering from a recent wildfire. Lance is an underachiever who cares only about how long until he will next “get laid”, and Alvin is in a long distance relationship with Lance’s sister. Where Lance is frustrated and bored with their work and its distance from any women, Alvin is strangely comfortable with the solitude. The friction that they cause between their oppositional attitudes fuels both comedy and conflict. 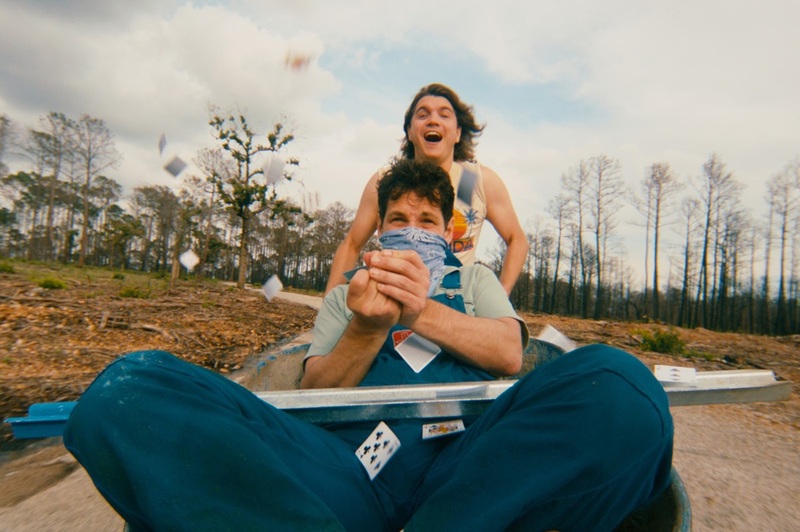 Filmed in Bastrop State Park near Austin, Prince Avalanche was created on the very modest budget of $725,000. Shot in secret over just 16 days, the film continued to be produced on a remarkably tight schedule and was only announced after being completed. In an interview with The Telegraph, Green explains his excitement at working in a “raw, reclusive environment, outside of the system, outside of the city”. The location and production mentality lends the film a highly sincere and refreshing tone that has a way of drawing its audience in, despite the inescapable banality of the premise. A heavy reliance on handheld shots conveys a feeling of humorous awkwardness in some moments, especially scenes involving movement as the camera seems to nervously follow the couple about the deserted landscape. This theme of humorous awkwardness is approached fairly unconventionally. Where most films will keep the genres of comedy and drama restricted to their own separate scenes, playing up the comedy in the first act before phasing it out almost entirely to be replaced with some kind of life event or love interest, Prince Avalanche seems determined to do both simultaneously and effectively. After falling out with one another, Lance chases Alvin through the woods, enraged. Both characters move with exaggerated awkwardness, Alvin running almost nonchalantly whilst Vince wheezes after him. In The Telegraph interview, Green muses over his attraction for films that “transcend or challenge those traditional notions [in genre]”. He goes on to say “you’re supposed to be taking it seriously but something strikes you as funny so you get nervous laughter.” Although it may seem a practice such as this would break the tension of a line, the intent is to create a greater atmosphere of realism, avoiding a more traditionalist “perfection” to a character’s delivery or gestures, and embracing the humour in dramatic situations. 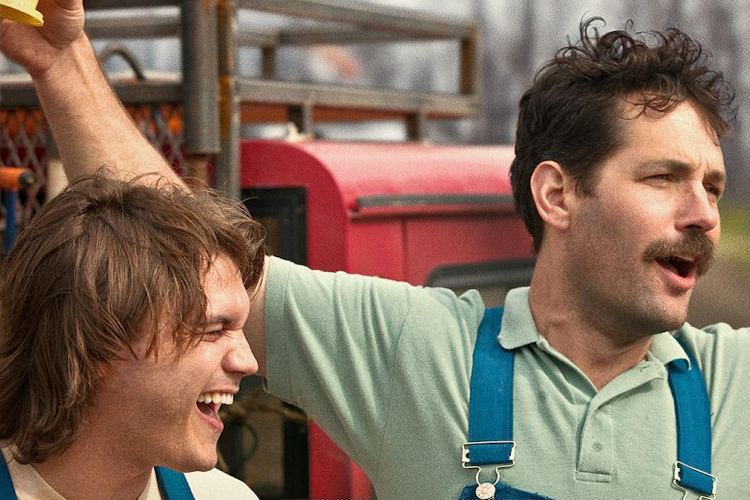 Made with a highly improvisational style, Prince Avalanche values seeing practiced comedy actors Paul Rudd and Emile Hirsch make what they will of the script. As Green remarked in Esquire Magazine: “I think the line of improv and prepared material becomes a little blurred in this movie.” At one point in the shooting of the film, the production crew came across Joyce Payne, a victim of a recent real forest fire, sifting through the wreckage of her burned home. She became a character that Alvin meets and converses with and who is a significant plot point of the film. The two leads also improvised an entire love song at one point in the film as they get drunk together. While esoteric and without any precise theme, the song “Bad Connection” is an example of the improvisational nature of the film that also fundamentally reflects the concepts of genre fusion between comedy and drama as the song comically comments on serious events in the film and underscores the characters’ underlying sadness. This drunken and moronic lullaby fades away awkwardly to the music of the film, composed by David Wingo and instrumental band Explosions in the Sky who season the film with a dreamlike, minimalist tone, once again punctuating the film’s unique comedy drama method. As it starts out, Prince Avalanche implies it might be a test of patience, with its long static takes and uneventful narrative, but the tone and characters are fascinating. The film offers an escape to the quiet American countryside punctuated by a kind of slacker comedy intermixed with a commentary on love and companionship, that is well worth seeking out.